Typically, modern developmental psychology focuses on experimental methods. Another, less well-used path, is to dive into case studies where a wealth of information can be gleaned simply through a mix of introspection and directed questioning. This is precisely the sort of developmental work that will only be conducted due to interest on the part of the researcher. Luckily, in Virginia Lowe, we have just that. Her primary drive is to understand how her two children’s interactions with books changes over the years and how books shape their thinking. There are obvious risks in this sort of work. Perhaps Lowe’s children are special in some way? Is their story representative of how this process unfolds in other children? There is no way that we can tell. Certainly on two fronts, Lowe’s book is invaluable. How her children relate to stories and pictures, and how this changes over time, are superbly documented. Reasons for why particular images or stories are enjoyed or discarded are convincingly provided. This information truly is a gold mine. But Lowe’s footing begins to slip when she addresses the sticky question of how children understand reality. As with so much work on this topic, key issues are confounded. Does her daughter really fail to understand that one character knows what another does not or that the emotion displayed is for comical effect? It could simply be that there are differences in linguistic and informational complexity between components of storylines. 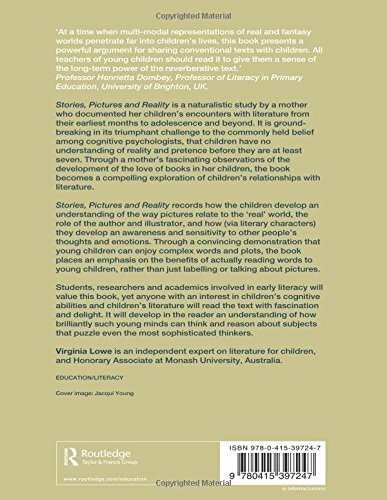 Theory of Mind caveats aside, Lowe’s longitudinal case studies will provide food for thought for anyone from children’s editors to the interested parent.